Originally from North Africa by way of Italy, our family has been making bottarga for hundreds of years (since the mid 1600's). Growing up in the early part of the 20th century in a third world country, they only had access to fresh mullet roe once a year, during the spawning season. Bottarga was mass produced at that time, by curing the roe to perfection, then waxing it to seal in the freshness. 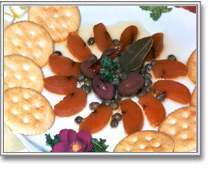 Bottarga was traditionally eaten with festive meals, such as Shabbat and holidays, and enjoyed for months after being produced, without the need for refrigeration. I was first introduced to bottarga at the young age of about 5 or 6 years old. My dad had gone to the local fish store and bought a mullet. Upon opening it, the fish monger found a small roe, much to my dad’s delight. He brought it home, and prepared it. Being a young, fussy eater, I was intrigued by the idea of why anyone would want to eat fish eggs. Day by day, I watched it drying, debating on whether or not I’d be brave enough to taste bottarga for the first time. Finally, my dad decided the bottarga was dried to perfection. He cut a small piece for me, squeezed a drop of lime on it and drizzled with olive oil. My first reaction wasn’t a good one, I was not expecting the unique taste. Probably similar to the reaction I had when tasting scotch for the first time. Definitely an acquired taste. However, as my dad started purchasing frozen roe and producing bottarga for us, I did a acquire a taste for it, to the point that my brother and I would fight over it as kids. I eventually started making bottarga myself, and when I had kids of my own, I introduced them to Bottarga at a young age. Bottarga has become a staple at our festive meals, following a family tradition that dates back at least 400 years. Needless to say, that when a recipe remains unchanged for that long, something must definitely be right with it. 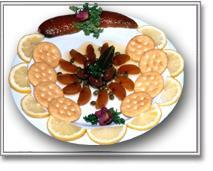 Thank you for visiting www.Bottarga.net, your trusted source for high quality bottarga, online since 2002. We are committed to make your shopping experience safe and secure. Our secure Paypal shopping cart, which also allows for Visa, MasterCard and Amex payments. We hope our commitment to providing premium quality bottarga, along with our secure online shopping site, gives you the confidence to purchase our product. We are confident you'll enjoy our bottarga as much as we do! Ingredients: Mullet roe, sea salt, sodium benzoate. Allergy statement: Product may have come into contact with traces of wheat, eggs, milk, peanuts or tree nuts.